I found out that Disney had made some sort of deal with Studio Ghibli when I came across a mountain of Ghibli merchandise at Epcot. I really wanted the five foot catbus plushie, but since there was the flight home to consider, I picked up something more compact, Hayao Miyazaki: Master of Japanese Animation by Helen McCarthy. Like most souvenirs, I forgot about all about this book until later, when I was doing some cleaning, and out of curiosity I sat down and read it cover to cover. As someone who was introduced to anime through Totoro, and still considers Laputa to be the best movie ever, I wasn't exactly sure what a book about my favorite studio would have to tell me that I didn't already know, but I was surprised at how much I learned from this book. Besides providing essential information like what Miyazaki worked on, when, what it was about, etc..., McCarthy goes a step further to explain the situation of Ghibli while a movie was being produced, the inspirations that prompted Miyazaki to create what he created, and analysis that goes far beyond "Ghibli's movies have a lot of nature and magic in them." Each chapter looks at a different Miyazaki masterpiece up to Princess Mononoke, and delves into every aspect of its production and story. Although the book wouldn't have been complete without it, I didn't find the character or plot overviews to be very interesting. The sections of the book I most enjoyed were those when Ms. McCarthy pulls from a large number of sources (the bibliography is 5 pages), as well as personal interviews with Miyazaki to add insight into the how and why of Ghibli's art. This book may not be for everyone. I know a lot of people who dislike close scrutiny of art and would rather just enjoy a movie and not bother so much with what it may be trying to say. Miyazaki himself has said repeatedly that he doesn't create movies to push a message of preach a moral. However, for those who like a little thought provoking criticism and a little insight into the art they are enjoying, McCarthy manages to explain everything in a deep and thought provoking way. Even if artistic analysis isn't your thing, learning that Laputa was inspired by the floating castle of Gulliver's Travels is an interesting piece of trivia for any Ghibli fan. The book is chock full of that sort of information, including a filmography of every project Miyazaki had a hand in, and production information for all of his major features. 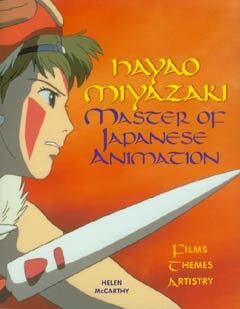 Hayao Miyazaki: Master of Japanese Animation is not a study in rabid otakuism. It's a very smart, very serious look at some of the best storytelling in anime history, and if it's approached as such it will be extremely rewarding. If you don't want the insight, and the facts aren't all that interesting, there's always the full color inserts to google at.